So for the last two days, Junior has had the stomach flu. Now, I have to tell you, this did not deter him from going to school Monday so I could pick him up in his new car. Sadly, the minute we got home, he announced he was sick and spent the rest of the afternoon praying in the bathroom for a merciful toilet god to let him stop throwing up. (Too much info? Maybe). 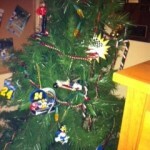 Yes, that is a Christmas tree. 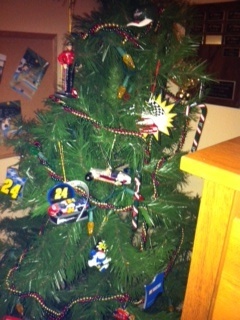 Apparently, in my holiday-induced stupor, I put up a small tree in Junior’s room, then forgot about it.